Due to the proposed tax included in the health care reform, those seniors in Medicare Advantage will be facing a $50-$90 per month increase in premiums and/or reductions in benefits next year. 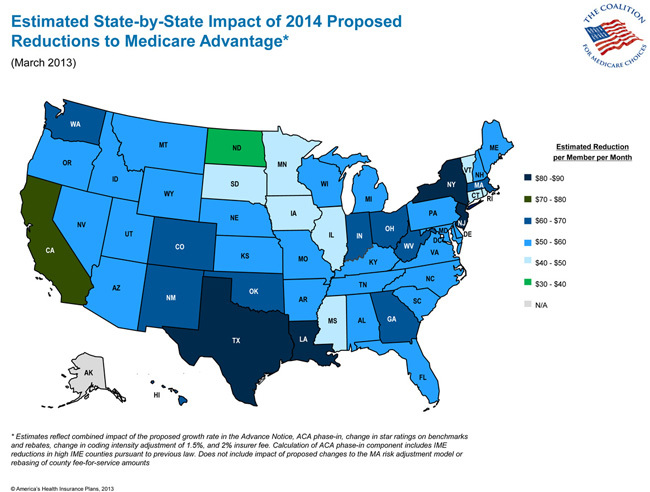 This week, new Oliver Wyman data released by America’s Health Insurance Plans’ (AHIP) Coalition for Medicare Choices (CMC) provided a breakdown of which states would be most impacted. Seniors in Louisiana, New Jersey, New York and Texas will be hit hardest with their plans increasing $80-$90 a month. California seniors are expected to face a $70-$80 a month increase on their premiums. Most other states will see increases of $50-$60 a month with North Dakota seeing the lowest increase of just $30-$40 a month in premiums. In the past week 120 members of Congress have expressed their concerns about the impact the new cuts will have on seniors. Twenty-two Senators sent a bipartisan letter to the CMS about their concern saying "we are concert that the proposals could result in reduced access for our constituents who are enrolled in Medicare Advantage. Plans have informed us that they may exit certain markets as a result of CMS’ proposal." The ninety-eight members of the U.S. House of Representatives’ letter stated, "The assumption on the SGR is particularly problematic because it almost certainly will turn out to be wrong and it directly translates into lower funding to support the health benefits of the 14 million Medicare beneficiaries who currently are enrolled in MA plans." Meanwhile, AHIP has offered a recommendation to stabilize the program and avoid significant disruption to seniors enrolled in Medicare Advantage. The 2014 MA payment rates are scheduled to be finalized April 1. Precision Senior Marketing will be closed after 1pm Friday, March 29 for the Easter holiday weekend. Regular 8am-5pm CDT hours will resume Monday, April 1. We wish you and your loved ones a happy holiday. We appreciate your business and the opportunity to serve your needs. Are you surprised by these Medicare Advantage increases? How do you think it will affect the program? Pre-qualify your sales leads 20% more accurately. By purchasing higher quality leads you are less likely to be calling the people not in your target demographic. Take a look at what areas you have been successful and where you haven’t been doing as well. Create a quick profile of your ideal customer and target those specifically. Disqualify your sales leads 20% faster. At this point in your career you’ve learned to identify pretty quickly which prospects don’t need your product or don’t have the money to afford it. Don’t waste time with those false opportunities! Politely end the conversation as quickly as possible and move on to the next prospect. Close 20% more of your opportunities. Obviously, the more opportunities you close the more customers you will have, and thus the more money you will be making. However, where doubling or tripling your close rate is probably impractical right away, anyone can make a 20% improvement. The easiest way to do this is to stop trying to sell and instead listen for your “go-ahead signals” during conversations with prospects. Put aside a fear of failure and ask for the business. Increase the average value of each deal by 20%. There is a fixed amount of time and money connected to each of your sales efforts. Making two deals for $300 each takes far more time and effort than one deal for $600. Therefore, it’s important to constantly be aware of additional ways that you can help the customer. Maybe they might also be interested in a Final Expense or a Hospital Indemnity product during a Medicare presentation. This is not upselling; it’s providing a better service to your client. For any questions or further discussion on improving your sales or the best lead companies feel free to contact your PSM marketer at 1-800-998-7715. What other things have you done to increase your sales? Do you think these techniques would be easy to implement in your business? No matter if you are just getting into the senior market or have been in the industry for years, selling Medicare supplements or med supp over the phone is a great way to expand your business. When you prospect over the phone, you are able to broaden your sales horizon beyond your immediate driving area and allow yourself a virtually unlimited selling territory with no travel requirements. Therefore, you can connect with an entirely new market of qualified prospects, no matter the distance. By tapping into this national pool of prospects you’ll see increased productivity through your ability to “see more people” in your normal workday. Having this freedom will additionally allow you to cherry pick your territory by marketing to areas where you know your products are the most competitive. You’ll reduce your daily overhead through savings on gasoline, tolls and parking, and also save time through the elimination of unnecessary paperwork further increasing overall productivity and efficiency. When it comes to the sales process, a few options are available for completing an application over the phone. Most popular to agents, many carriers have developed electronic application (e-app) or telephonic application technology to speed up and simplify the process. Among these carriers you’ll find Mutual of Omaha, Cigna Medicare Supplement Solutions, Equitable Life & Casualty, Heartland National, Combined Insurance of America, and Sentinel Security Life. The senior insurance market is exploding and selling Medicare supplements by phone will help you use technology to your advantage to reach prospects virtually anywhere in the United States, from the comfort of your work space. For more tips on selling med supp by phone, please contact your marketer at 1-800-998-7715. Do you sell Med Supps over the phone? How has it changed your business? This week America's Health Insurance Plans (AHIP) warned that the potential 2.3 percent reduction in Medicare Advantage payments proposed by the Department of Health and Human Services (HHS) combined with PPACA's payment cuts will result in benefit reductions and premium increases of $50 to $90 on average. These cuts would affect 14 million seniors which is roughly 28 percent of all Medicare beneficiaries. An analysis prepared for AHIP states that the effect of the changes from both PPACA and the new payment cuts will result in an estimated 6.9 to 7.8 percent cut to Medicare Advantage plans in 2014. The cuts were proposed last week by the Centers for Medicare & Medicaid Services (CMS). New rules will be published by CMS on April 1, 2013. Subsidies will be slashed and access to the report will be severely restricted, according to the AMAC industry analysts. The analysis was made by actuaries at Oliver Wyman and was prepared for AHIP. The Oliver Wyman report states, "Virtually all of the 14.1 million Medicare beneficiaries are likely to be affected by these changes, either through increased premiums, reduced benefits, or plan exits from local markets." The major impact of these changes will reduce Medicare Advantage in 2014 by more than eight percent or nearly $11 billion. Understandably, health insurance stocks reacted to the news negatively and took a hit. The costs per person for Medicare Advantage plans are a bigger drop than many analysts had anticipated. So far in 2013, only four percent of PPACA's $200 billion in Medicare Advantage cuts have gone into effect. However, the Congressional Budget Office (CBO) projects that, after it's fully phased in, the cuts alone will result in three million less people in the program. The PPACA's new health insurance tax will begin in 2014 and Oliver Wyman has previously estimated that this tax alone will cause approximately $220 in higher out-of-pocket costs for seniors, reduced benefits for next year, and $3,500 in additional costs of the next 10 years. AHIP contrasted the cuts by releasing projections for medical cost increasing three percent. Karen Ignagni of AHIP stated "The proposed changes to Medicare Advantage payments are a crushing blow to the millions of seniors and people with disabilities who count on this critically important part of Medicare." How do you feel about these rate increases to Medicare Advantage? How do you think it will affect your business? Do you think this is positive for your Medicare Supplement business?